Aggregating lines, Part I - Robin Lovelace's website. Energy. Transport. Technology. Change the World. It’s been a busy 12 months but with the Geocomputation with R book nearing completion1 I’ve finally found some time to update my blog and do a bit of thinking, about the tangled topic of line aggregation. The transport ‘flow’ on any particular segment of the transport networks is the aggregate (sum) of trips that pass through it1. Finding the flow across a transport network based on input data composed of individual routes, is therefore an aggregation problem. It requires a more complex solution than that provided by the aggregate() function in the base R2 package stats, however, because the geometry of the output LINESTRINGs will be fundamentally different than the input LINESTRINGS of the routes: a route network is composed of many small way segments, but a route is a single long LINESTRING. Creating such a route network, with aggregated values per segment, is the problem that the overline() function in the R package stplanr was designed to solve (see a 3.5 yr-old question on gis.stackexchange.com for more context). The function works well and is the basis of the Route Network layer (MSOA) in the Propensity to Cycle Tool (PCT). In fact it was developed precisely for this purpose, as illustrated in the image below, which shows a common visualization/analysis problem encountered by transport researchers when working with multiple routes: overlapping routes are not easy to identify from non-overlapping routes: notice the red lines in the centre of Leeds in the image look the same as the red lines on the outskirts, despite representing much more movement. Figure 1: Demonstration of the need for line aggregation from a very early version of the Propensity to Cycle Tool, developed at the ‘Hack my Route’ data dive at ODI Leeds. Figure 2: Illustration of the overline() function for line aggregation in action on a tiny example dataset. Note the left-most line is wider than the two lines that feed into it, demonstrating how line aggregation can be used to estimate flow on a road network. Figure 3: Early version of the route network layer in the Propensity to Cycle Tool. This works great and the resulting network is used for strategic network planning: you can download route network data in the ‘Region data’ tab of the PCT3. 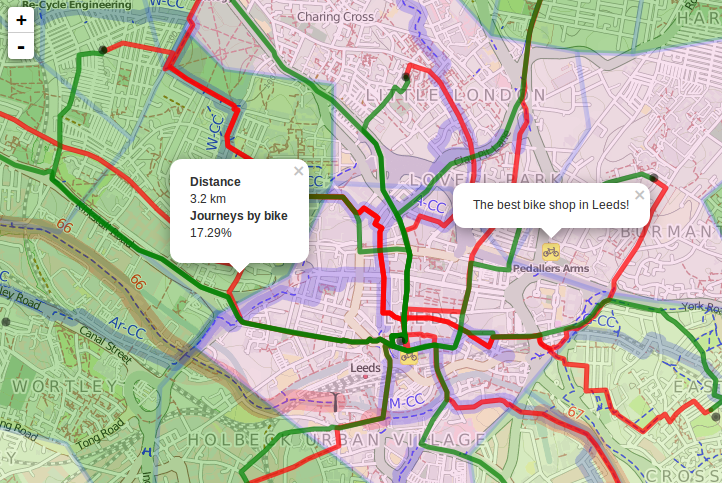 The route network data for Leeds can, for example, be downloaded as a .geojson file from here. But there are some issues: the function works on the older SpatialLinesDataFrame class defined in the sp package4. This data class has been superseded by the simpler sf class in the sf package, which is faster than sp for some (if not many) operations. Another issue with overline() is that in some cases when 2 lines meet, the resulting aggregated line can be longer than it should be. So there are performance and functionality issues to address. Rather than solve them all here, this post sets-out the issue using reproducible code and suggests next steps for a new overline() function (or perhaps just an updated overline.sf() function which currently just wraps overline.sp()). Rather that starting from scratch and writing a geographic algorithm from the ground-up, we will start by exploring solutions provided by existing packages, notably sf, which provides an interface to the GEOS library. That leaves us with a ‘clean’ object that only has a value (7) for the attribute column name we want (value). Figure 5: Illustration of a route network generated with sf functions. The results are not Earth-shattering: the new function seems to be around the same speed as the original, if a little faster. This is great news, but remember: the new function only works on 2 lines so is much simpler. More work needed! So a more complete overline.sf() function is needed. That will (hopefully) be the topic of the next blog post. 1. Hollander, Y. Transport Modelling for a Complete Beginner. (CTthink!, 2016). 2. R Core Team. R: A Language and Environment for Statistical Computing. (R Foundation for Statistical Computing, 2018). 3. Lovelace, R. et al. 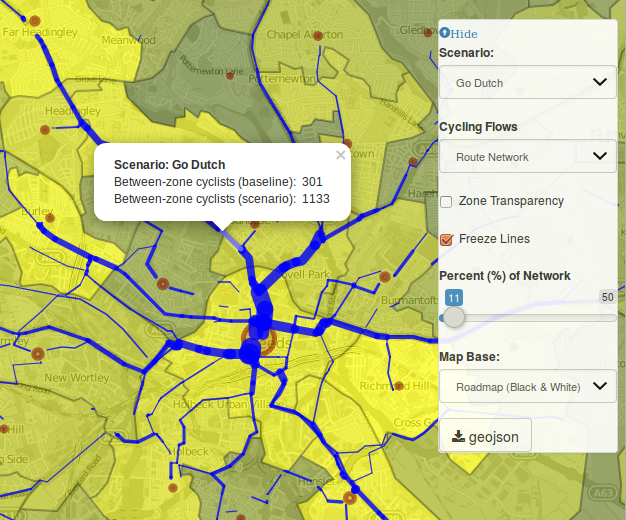 The Propensity to Cycle Tool: An open source online system for sustainable transport planning. Journal of Transport and Land Use 10, (2017). 4. Pebesma, E. Simple Features for R: Standardized Support for Spatial Vector Data. The R Journal (2018). 5. Lovelace, R., Nowosad, J. & Muenchow, J. Geocomputation with R. (CRC Press, 2019). 6. Knuth, D. E. Computer Programming As an Art. Commun. ACM 17, 667–673 (1974).